my car immediately prior to its carwash this weekend. It's that time of year, isn't it? Things are grey, at least in this part of the country. My car is grey from the salted streets. Event the parking lot is grey. Lots of days, the sky is grey. It's mid-winter, and things are a little bland. Except for that cold wind. The cold wind is anything but super-sub-zero bland. Although I'm not one that struggles with Seasonal Affective Disorder (that I know of, at least), I sure have to find ways to help the cold days pass. Here in Wisconsin, there are a lot of cold days. What do I do to keep away the grey? Get to the gym: When it's cold like it has been the past several weeks, there's really not much opportunity to spend time outside. I miss the fresh air, but I do my best to get to the gym. Use fresh ingredients in my cooking: Even in January, I love fresh ingredients - especially fruits. It costs a little bit more when nothing is growing regionally, but I still buy a pint of strawberries, raspberries, or blackberries each week, and enjoy them with breakfast. Use a wake-up light on a timer: I know I talk about it a lot, but setting a light timer for early in the morning so my bedroom is light when I wake up has revolutionized my mornings. I jimmy-rigged mine, but it looks like they actually make these things! What do you do to keep the grey away? Have you ever considered a mood lamp? I have. 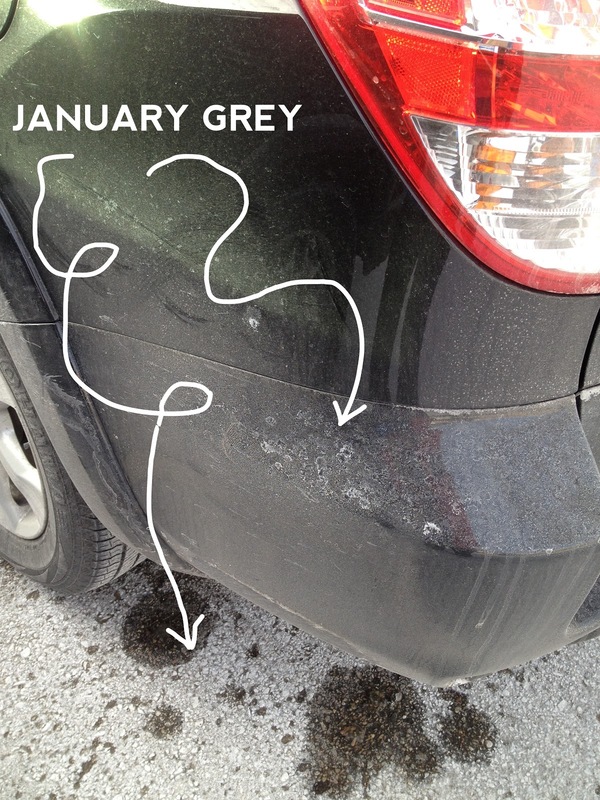 I HATE what salt has done to my car!!! :/ so frustrating. That light rig thing for your alarms in the morning sounds amazing.. what do you do! ?